University of East Anglia last month announced that UEA researchers have pioneered a patient-specific 3D virtual birth simulator. The research' aim is a virtual birthing simulator that can help doctors and midwives prepare for unusual or dangerous births. "Patient-specific" is the key aspect of their work, as the program takes into account the mother's body shape and the position of the baby to predict what might take place during the birth event. The team prepared their presentation last month for the International Conference on E-Health and Bioengineering in Romania, which took place from November 21 to November 23. Dr Rudy Lapeer, from the university's school of computing sciences, said, 'We are creating a forward-engineered simulation of childbirth using 3D graphics to simulate the sequence of movements as a baby descends through the pelvis during labor." The study is titled, "Towards a Forward Engineered Simulation of the Cardinal Movements of Human Childbirth'." The authors are Zelimkhan Gerikhanov, Vilius Audinis and Rudy Lapeer. 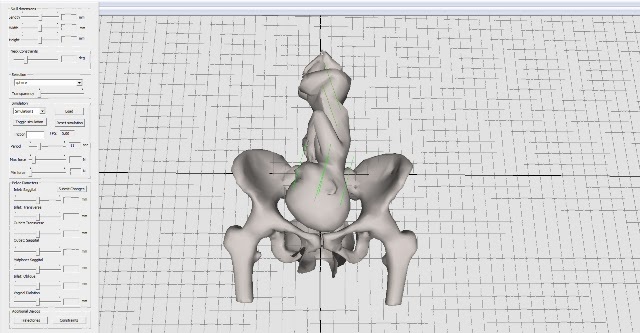 The user inputs the patient's relevant anatomical data –size and shape of the pelvis, the baby's head and torso, for example. The simulation software will see ultrasound data used to re-create a geometric model of a baby's skull and body in 3D graphics as well as the mother's body and pelvis. This will make the medical team more aware of scenarios that can take place during birth. For example, one would see if the baby's shoulders could get stuck during childbirth. According to the university release, "Programmers are also taking into account the force from the mother pushing during labor and are even modeling a 'virtual' midwife's hands which can interact with the baby's head." Lapeer said, "We hope that this could help to avoid complicated births altogether by guiding people in the medical profession to advise on caesarean sections where necessary." Lapeer has cited his general research interests as "mainly in medical visualization, surgical navigation and simulation, physics simulation and biomechanics." He also described what he and his team have done in the specific area of human childbirth mechanics. "We have studied fetal head moulding using finite element analysis and more recently investigated the effect of forceps delivery on the fetal head and the biomechanics of shoulder dystocia."